Loyal shoppers do not need to be educated about your website flow, products, customer support and after sale service. Most importantly there is a trust factor among you and customer so it converts easily, cost less to service add to your page views. Loyal customers also help you with good word of mouth and that plays important role in increasing conversions. According to various intrinsic Ecommerce survey by Adobe, eConsultancy and Marketing Metrics; Conversion of repeat customers is almost 5 to 9 times greater than first-time buyers. As per the research 8% of all site visitors contributes around 41% of the revenue. 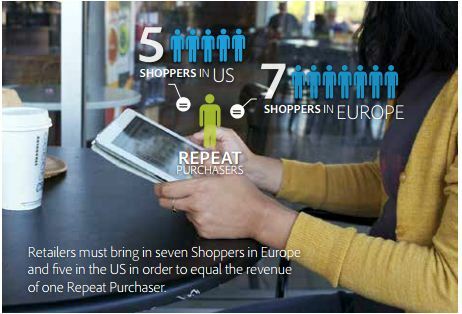 A single repeat shopper could be worth many new customers. As per Adobe’s recent study, a customer making a second purchase may spend 3 times as much per visit as first-time shoppers. While true repeat customers who have made three or more purchases may spend 5 times as much per visit as new customers. Loyal shoppers are great influencers and generate additional revenue through word-of-mouth or sharing it on social media. So it does make more sense to not only run after generating new customers but also spend efforts to convert existing customers to your loyal shoppers. So what should online businesses do to increase repeat customers? Make it easy for customers to shop – No matter it’s first time visitor or repeat customer, it should be easy for everyone to browse, compare and purchase from the website. Usability with fewest clicks purchase improves your conversion by two folds. Some of the most common features are – Guest checkouts, Social media for registration, Show total cost inclusive everything upfront rather than at very last stage to reduce bounce rates from checkout pages and as per the product type, we can suggest much more. Instil the confidence in your customers to purchase – You should make sure your website is secure and customers feel secure sharing their personal and financial details without hesitation. Stay always available – Since the smartphone growth, it became essential for every online business to be smartphone browser compatible. Customers want to associate themselves with smart businesses and they want to shop on the move. If you want to ensure loyalty among smart customers, you should be ready to quick and adopt latest technologies as early as you can. Make your websites responsive, compatible with all latest browsers and localise depending upon demographics of your target audience. Offer Quality Products– No matter how good your website, if your products are not of quality; your chances of getting repeat customers goes down drastically.Loyalty requires proper quality checks and maintain return rates to take quick action. Provide Excellent Customer Service– Safe purchase, Quality products are not enough. As per the latest surveys and my personal experience, customer service plays a vital role before and post purchase both for conversion and repeat customer. Please have real humans for supporting and addressing your customer’s query. It’s simply unacceptable to keep sending automated emails without a human touch to your communication.Proper timely addressing customer concerns increases their confidence to come for repeat purchase and also tell others to just go ahead and place an order on your website. Keep Competitive price – Price matters especially for branded and consumable products. Online customers are always going to price sensitive and for them to switch it doesn’t ask for more than 5 min searching on Google and find other places to buy and compare the price. So it’s always advisable for E-commerce stores to look at long term benefit. Repeat customer gives you more chances to generate a consistent profit so look at the compounding numbers rather than profit for one-time purchase only. Reward Repeat Purchases – Reward is not always about giving discount coupons but other small gestures also work as reward, eg. offer to expedite shipping, free delivery even for Cash on Delivery orders, No charges for return shipping, Quick and priority customer service etc. Be Courteous – Make sure to treat your customers nicely, never stop saying “Thank you”. It costs almost nothing. Kindness and gratitude for a customer’s business is an undeniable way to further enchant them for the long term. So E-commerce is not only about having a great product or website but your technology and service must learn to be human. Treat your repeat customers as your brand ambassadors. If they are happy, they will definitely improve your revenue. At Yi3ld, we create websites which are secure, responsive, easy to navigate and as human as need be. We Yielders follow all of this even in our services to ensure our customers are our biggest ambassadors. With this post, we would like to Thank all of our customers choosing to work with us and recommending us to new references. If you just remembered one more reference, please feel free to write us.